Reaching out to Mandy in my last blog post has already brought a number of precious gifts. Reading the many beautiful comments for our Courage-to-Receive-Game, has created opportunities for me as a humble yet ambitious teacher of the Fertile Heart Ovum Practice, to better understand how to support you; how to offer more concrete guidance for unwrapping the gems that showed up, even in the short time of playing this game. I see a thrilling learning opportunity here for all of us, regardless of whether or not we’re “in” the game. Of course there are no should’s linked with it. Just to be clear: PLAYING THIS PARTICULAR GAME IS IN NO WAY A REQUIREMENT FOR THE TELECLASSES OR ANYTHING ELSE RELATED TO THIS COMMUNITY. And as some of you astutely observed, the Orphan can only see the world, everything and everyone in it, as a chance for slurping up another drop of self-blame, or to place herself in exile. This lovely game of ours is just that, a game. An experiment and a game. Hopefully one of many games we’ll get to play together. Each of them will probably appeal to some and not to others. Making a commitment is always first a commitment to ourselves, not to anyone else. We make it publicly because it raises the stakes a bit, and makes the life of a learning community a little more interesting. We also make it publicly because the road of the Visionary is a lonely, not very well traveled road. It becomes a lot less lonely, and the labor pains much more bearable, with one or two midwives in attendance. A joyous commitment is also a background that brings into relief that which we otherwise wouldn’t be able to see. A commitment is an adult’s strong arm for the Orphans to wrestle with; some ground rules laid down by a loving Ultimate Mama, that never ever says: Look at you, failed again! All she does is stand by and watch. Compassionately. She knows we always do our best. She knows that we have generations’s worth of challenges to overcome. She knows how special and one-of-a-kind-creatures we all are. She is rooting for us. She offers opportunities carefully tailored for our astonishing talents. Especially the ones hidden to ourselves. So: Thank you to those of you who play, and thank you to those of you who witness. Thank you, thank you to all!! A couple of suggestions to anyone who feels inspired to jump in, or to continue this adventure: See if you can, just for the purpose of this game. (otherwise feel free to indulge) resist the impulse to judge yourself as good or bad or judge the fact that you did your practice as good, and the fact that you didn’t, as bad. See if you can simply observe the truth. If it’s not too late in the evening and you want to share a bit of insight you discover about the practice to inspire the rest of us, that’s great. And here is something to add a bit more color to our play. If you’d like, choose a number on the scale of 1-10 as to the fullness of heart and space you create for the Imagery and Body Truth. Again, as tough as it is to not judge, give it a try. There are days when I find myself in bed at night, and my body tells me, I didn’t do a full enough Body Truth. And there are days when I choose to go to sleep anyway. On other days, my body clearly wants me to get out of bed and do it. So I stumble into the living room, and release whatever issues of the day still linger in my tissues. Not because I I feel some sort of obligation, but because my Holy Human Loaf craves a bit more sweetness. The courage to lovingly witness the truth without analyzing and explanations is one way to practice compassionate parenting. Something most of us with human parents didn’t get enough of. It’s an expression of our courage to give. To ourselves first. And it’s the same as the courage to receive. From ourselves. That’s the secret of the kiss. In a passionate full bodied kiss, as in any passionate full bodied act, we give and receive at the very same time. Yes, I did the practice today. After re-reading the original post, I was reminded that Julia put this game as working on the “courage to receive.” I’d started thinking of it as the “courage to play.” I guess it’s both. I’ve been doing the exercises; changed to do Fertile Soup and the Welcome Home body truth from the CDs. Julia’s first post (in response to Mandy) mentioned checking in here each day to note if one had done the exercises or not. I feel a bit self-conscious doing so, as no one else is, but it’s one of the few parts of Julia’s game that I can play. It also feels good. Suzanne, I know what you mean about holding back for fear of failure. I’m trying to be kinder to myself about this, try to drop the judgement and just notice if I’m doing it, and remember that I have a choice about it. I’m still a scaredy cat about a lot of things, but sometimes not. Yes, I practiced the imagery and body truth today. I’ve been doing The Playground. Sometimes it is hard to get started, but this morning I thought of one of the intentions of the imagery — “to spend time with your child” — and rather than feeling any resistance it got me out of bed with a big smile on my face. Posting to say yes, I did the practice today. I guess (on a scale of 1 to 10), it has morphed to be about an 8.5. I still feel some resistance to getting started, but I enjoy it when I’m doing the exercises. In the spirt of the first post, just posting to say yes, I did the practice today. I’ve returned to doing imagery and body truth the last few weeks. Mostly I use the CD rather than just try to remember the exercises. I’ve found that really helps me to keep doing it regularly, otherwise it’s easy for the practice to drag on and for my mind to wander. When I’m not using the CD there’s an “I’m not enough” orphan, who I’ve noticed often comes out to tell me I’m not doing it well enough, or long enough, or seeing enough, etc. Now that I do use the CD, she sometimes says that’s “not right” either, that I “should” be able to do it by myself, I’m not disciplined enough … Finally, I just decided that this is how I can do it, so that’s what I’m doing. Mandy, I love the bucket idea. I would have loved to try that one when I used to teach kindergarten. I wonder how I can use it in my day to day life now. Gal, I like the idea of practice as a prayer. I think of it as an act of faith, too. Thankyou for creating a place and making a call for greater commitment. I was just at a place of really asking myself if I actually do believe it is possible for me to conceive again. I always say yes, but I have always known to do that with many things. Say Yes and just keep going. The last month or so I have been really looking into what faith is, what hope is? I donate some to St. Jude children’s hospital and I noticed they have a section on their website relating to hope and how to have it when your child is in such a battle for life. So far in my reading and thinking on this topic I feel practice is one thing that can honor faith and hope. Practice is like a prayer. I guess I always have been waiting to just have some sort of feeling of safety and something I could count on in my life. Maybe it isn’t having a guarantee or even a total knowing but that when I feel the doubt, the orphan’s fears it means practice and pray. So thank you for giving me a place and the encouragement to keep reporting on this. It feels like a community. It seems a month of excuses, procrastinating, dithering and hand-wringing is enough. Actually, I had to laugh at myself when I sat down three weeks ago having finally “decided” to make this public commitment to the first post, only to find Julia had already made a second post, and even then I still didn’t bring myself to do it. In the meantime, I’ve restarted doing imagery regularly in the morning and evening, as well as a long-neglected body truth exercise in the evening, and it feels good. So if you’ll have me, here I am. Here and now, I am in. But in this week’s “frames” exercise, my visionary has been telling me to speak up, so that’s what I’m going to try to do. Reading this evening, my focus was drawn to the idea of observing-without-judging ourselves, our practice, or our actions more in general. Wow. It’s a taller order than it sounds. Through this practice I’m learning to accept (even love) and not judge myself, my orphans, or the messages my body sends me, in the moments when I’m actually focusing on the FH work. And I think I’m getting better at that, even if I still have far to go. But I want to extend that challenge into the rest of my life: to be more mindful (or heartful, as Julia reminds us) of my reactions, and any underlying orphans, at any other time they may crop up, and to be able to respond from the heart of the visionary, whether I’m having a hard day at work, stuck in traffic, or struggling to maintain a civil tongue with the in-laws or neighbours… So that’s going to be my mission: to try and be compassionately aware of myself throughout the day, and to observe and own my feelings and reactions without judging them. I am a witness, still, because of my husband’s uncertain job situation and some things I have relayed to Julia in an email. I am still looking for where everything fits for me. I have been doing the imagery every day – the three frames. I am a 6 in my commitment to the imagery. I haven’t found the body truth for this week, but did it last week. I have been doing 3 frames – mostly related to fear about my husband’s job situation. I believe the visionary wants be to live brave. This blog hit the spot for me, very sweet to read. Reminds us to to be true to ourselves. I’m enjoying following the Courage-to-Receive players, and it spurs me on. At the I’m finding lots of help in my life from doing the imageries “The Backpack” and “The Ropes of Obligation”. This is just response part one to say that I have read the blog and as always, am inspired Julia. Thank you! I was still gathering my thoughts from reading the first blog and then you slipped another one in there! I will post a proper reply this week. One thought that comes to mind is that if we don’t fully commit to something then we can’t really fail either (because we didn’t REALLY try) so it is a rather strange way of protecting our orphans …. the ones who don’t like failing …. I have been doing the Fertile Heart work for four years and yet it is only in my fourth year that I feel I am really doing it. Doing it like I mean it, need it, believe it and it feels great! I guess I had a lot of orphans who kept me half-committed and now my UM and V are much stronger. Mandy I love what you shared about the buckets!! 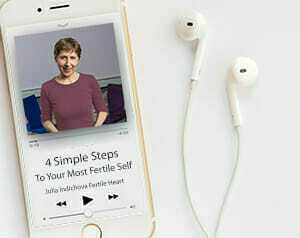 I am new to the Fertile Heart work and to this website and blog. I have read through the last two blogs and posts, and I wasnt sure whether I would add my voice – So, I stepped away for a bit, lit the Christmas lights, tured on some music and started wrapping gifts… Things for nieces and nephews and children from my husbands previous marriage… I called my sister to talk about things we will be doing with her children over the holidays [its so kind of her to share them :) ]. But what made me decide to post was when my mind went to my doctor’s appointment scheduled for tomorrow at 2pm. This is a follow up with my RE who in October reviewed my options as he saw them from his medical perspective. I was “relieved” when he assured me that he would not refuse another attempt at IVF (we had tried one cycle which did not get us to the point of the actual IVF). I was sure he would deny this option because I thought for sure I would screw up his statistics… his response was, “You never want to look back and feel that there is something you did not try. You need to be comfortable that you have explored every option.” Of course he went on to say that if he were picking up my file for the first time, he would not RECOMMEND IVF, but rather donor eggs. You see, according to him, everything else… everything except my eggs… is PERFECT. I did not cry at that appointment, because I knew that we were going to try again on our own, and I knew that we were going to succeed. Imagine his surprise when I called him a few weeks later to tell him that I was pregnant… and imagine then what he must have thought when it turned out to not be a “viable” pregnancy and I miscarried for the third time. I have been one of those “patients” who comes to an appointment informed, and with questions… and then feels almost like I am breaking some rule when I ask them. Dont get me wrong, in this case particularly, it is not my Doctor who is making me feel that way. In fact, for a Reproductive Endochrinologist, he is a very kind and compassionate man. Although I have not been on this particular part of my journey long, something about making the committment to be here has given me the confidence to tell my doctor that I intend to try again, on my own… maybe not in 14 days or even a month. But even as we gather information on “alternatives” I cannot ignore that inner voice that keeps whispering to me that it is possible for me to conceive and carry a child. I look forward to a lot of kissing; both figuratively as noted in this blog … and literally, since kissing is so much part of the fun. Your blog is beautiful, Julia. In my first grade classroom right now, we have been talking about ways to “fill each others buckets.” We all carry around a bucket each day and the actions we put forth to others either add something to the person’s bucket, or take something out. The kids have discussed how when we put something into someone else’s bucket, OUR bucket also gets more full! It’s been inspiring to see them actually discuss this concept on their own, and realize, at such a young age, that giving makes you feel sooo good, and brings its own gifts. It makes me happy to know that the gifts you are constantly giving to the fertile heart community are coming back to you as gifts as well. You do so much for us, and I thank you. I read this post and thought, I was getting so much comfort from the group, and feeling so much better about my struggle being part of the community, and my orphans dragged me away to a place of isolation and sadness. I told myself I needed a “break” from everything, and stopped my visualizations, stopped taking my temperatures, stopped acupuncture, and tried to not think about getting pregnant. But the truth of the matter is now, 3 months later I am no further along and I am stuck where I was before I found “Inconceivable”… The only difference is I have the courage to acknowledge that, put my orphans in the backseat of the car where I can acknowledge them but keep their hands off the steering wheel, and find my way back to the fertile community. I can certainly relate to Mandy and others that posted. I struggle everyday to stay on this journey. But I’m trying to take it day by day. I also feel like I am on a quest. In fact my husband and I had a retreat we attended before we were married and in one session we had to name our life philosophy and I named my the quest. So, telling that years ago before I was even married and knew I would have this journey, the quest was my mantra. For as long as I can remember I’ve always had this part of me that feels dissatisfied with where I am in life. And I’ve tried to ignore the voice and move forward but I always seem to end up with the same feeling. I understand that I need to hear this voice and the FH journey is helping me do that. It’s definitely a work in progress for me. love this. thank you julia. i want to read a few more times but something i need to hear over and over again. I wrote this as a response to the previous blog, but I feel like I’m always a day late and a dollar short, so I’ll post it here instead. I just saw Julia’s invitation for the first time yesterday, and had an opportunity to respond tihs morning. I choose to commit to being a part of this. In my life I have played the role of “drop-out” too many times, so I will accept the challenge. Mandy, your post expressed beautifully that which I have felt many times. I know for me there is fear in doing this work because it isn’t a quest that is necessarily taken on a luxury bus. I am learning to add luxurious elements to it, but the road can get pretty bumpy and it is though the tires on the bus are made of material that cause each and every bump, each and every pothole in the road, to be felt (and sometimes the bus stalls and even crashes) when I’d rather lounge and take in the view, and just be delivered to my destination as quickly as possible. That’s my experience anyway. Last summer I began doing a Body-Truth exercise (can’t remember the name, comes after defend and Receive on the CD I think) where you state that you are ready to face the truth. I did it for about 4 days then quit. I realized I wasn’t really ready or courageous enough to face whatever truth was lurking there. I’m still not. Last night and this morning I did 2 Body Truth Exercises –Let it Be and Follow the Longing–and 2 imagery exercises, The Pillow and A New Beginning, all from The Fertile Female. I am planning to do these for a full 28 days, because I have found in the past that a longer commitment to an exercise creates more powerful insights and outward changes. I feel my commitment needs to include dreamwork too but that’s harder because I feel like I have to write stuff down, and its harder to find the time. Even though Julia has recommended using beautiful journals, I have always used cheap notebooks. Some time ago I bought a nice purple hardbound (leather) journal for this work, but it has been sitting in my closet for a year while I continue to use cheap notebooks. So I’m going to start using the nicer leather journal as part of my commitment. Another attempt to receive. and I can’t seem to find my way back to the wood. chase all the clouds from the sky . I am choosing to now call my journey a “quest“, because it sounds adventurous and purposeful, and the word wakes me up! I am reminded from my former Spanish Lit. days of the quest of Don Quixote, the chivalrous errant-knight who has been described as a character of unshakeable courage, faith and hope on a quest for justice and love. …..(although he was perceived as psychotic and ridiculous.) I’m wanting to read the novel now. I feel I need to spend more time with music and literature, so hence the references here. “Until one is committed, there is hesitancy, the chance to draw back, always ineffectiveness. Concerning all acts of initiative ( and creation), there is one elementary truth the ignorance of which kills countless ideas and splendid plans: that the moment one definitely commits oneself, then providence moves too. All sorts of things occur to help one that would never otherwise have occurred. A whole stream of events issues from the decision, raising in one’s favour all manner of unforeseen incidents and meetings and material assistance, which no man could have dreamed would have come his way. Whatever you can do or dream you can, begin it. Boldness has genius, power and magic in it. Begin it now”. Will I be able to uncover the strength to follow through on this commitment, or will I drop out?